We love Montana and its endless big sky. Our Dad was born and raised in Great Falls and every year we visit our Grandpa who still lives there, and unwind in our family cabin in Wolf Creek. For the past several years we have been spending Thanksgiving at the cabin, and although this holiday we could not make the trip all together, Ivy and our Dad went for a long weekend trip. Ivy visited Great Falls and Helena (Montana's Capitol) but she spent most of her time at our cabin hiking with our dad and enjoying some time off. Lucky Her! Big Sky coffee in the morning frost. Here are some of our recommendations for things to do and places to eat & drink. $ The Sip 'n Dip Lounge Great Falls, MT. This place is a serious MUST see. It's inside the O'Haire Motor Inn, walk right in and head up the stairs to the Lounge. 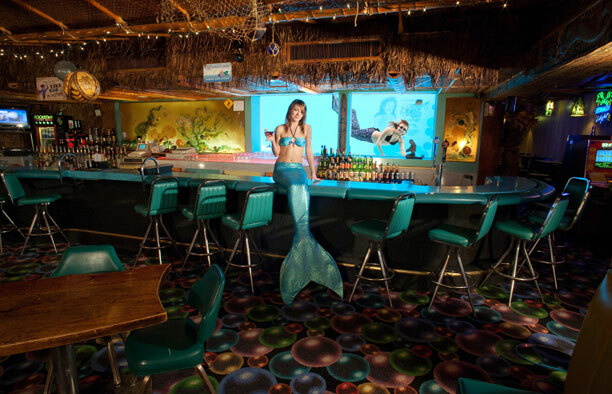 It's essentially a Tiki Lounge with ocean themed decor and the focal point being a huge glass 'Mermaid' tank behind the bar with real mermaids swimming around! Be sure to check out the schedule so you are there when they are swimming behind the glass. They also have a killer $2 well drink/domestic beer happy hour Monday-Friday 6-7pm and again from 10pm -12am. We recommend trying their fishbowl (with some friends) and their signature blue mimosa! $$ The Celtic Cowboy Great Falls, MT. Ivy stumbled upon this place when looking for places to eat in Great Falls. This place definitely has an Irish pub atmosphere including their menu and decor. They have everything from fish and chips to bangers and mash to fill your Irish heart (and stomach) with joy. We tried the Irish nachos that include house made potato chips topped with an assortment of goodies on top including dubliner cheese and corned beef. It was tasty but we warn you the portions are HUGE! $$$ The Hawthorn Helena, MT. We wish they had a sister store here in CA because this place was amazing! The Hawthorn is a wine bottle shop and tasting room. Wine bottles with individually hand written tags line the shelves on either side of the entrance. A long wooden bar made from reclaimed pine bark beetle wood (the pine bark beetle leaves a blue ting to the wood) welcomes you. They have an extensive wine list and wine on tap! You can even fill growlers of wine for the road as well. Our favorite item on the menu this trip was the chardonnay slushie. This is the perfect place to meet friends! Grab a drink and meat and cheese platter for an afternoon snack or a drink before dinner. $$ The Parrot Confectionery Helena, MT. Although this place is locally known for their chocolate shop don't overlook the diner! The Parrot has been open in downtown Helena since 1922, and makes 130 different types of candies. We have been going here for as long as we can remember and ALWAYS order the same thing. A small bowl of chili. We wouldn't say its the best chili in the world but it always tastes the same, and always tastes good. (Try it with a side of vinegar and Saltine crackers.) Also on the menu is a large selection of flavored sodas, milkshakes, malted milkshakes, and phosphates (a tart twist to a regular soda). Ivy always orders a huckleberry milkshake, Eve usually tries something different each time but the malted milkshakes are her favorites. After a bowl of chili you can't pass up the sweets! $$$ Izaaks Restaurant Craig, MT. Craig is one of the most popular fly-fishing areas in Montana - located in the middle of nowhere - between Great Falls and Helena. The town sits on the banks of the Missouri river. Izaaks Restaurant was born out of a need to feed the hungry anglers after a long day on the river. If you're in the area we highly recommend this place - great steaks! Bad news for anyone visiting in the fall-winter they are only open during the fishing season (around April-September). $ C.M. Russell Museum Great Falls, MT. If you are a fan of western art and history this museum is for you. A treasure trove of C.M. Russell's art and life, the museum also features other Western artists. The museum includes C.M. Russell's original artist's studio and cabin. Free Giant Springs State Park Great Falls, MT. This park set on the scenic Missouri River is steeped in history. Recorded as the largest freshwater spring in the country by Lewis and Clark in 1805, it is the perfect place to picnic, walk along the trails, feed fish in the hatchery, or visit the Lewis and Clark Interpretive Center. There is plenty to do for adults and children. Free Gates of the Mountains Helena, MT. If you like hiking, this is the place for you! A wilderness area made up of 28,000+ acres and 53 miles of trails. Free-$ Holter Lake Helena, MT. Holter lake is located in the Gates of the Mountains. The lake offers swimming, boating, and camping. Try a Ferry Tour which runs from May-September. Adults are $16 and children $10. Book a tour here! $$ Spokane Bar Sapphire Mine & Gold Fever Rock Shop Helena, MT. This mining shop is really fun to visit. You can buy a bag of sapphire gravel at the store and sift through it outside looking for a variety of stones including diamonds, rubies, and of course sapphires.